Though its not a zeolite, it is found associated with minerals such as datolite, calcite, apophyllite, stilbite, laumontite, heulandite etc. in vains and cavities of basaltic rocks, sometimes in granites, syenites, or gneisses. It is an indicator mineral of prehnite-pumpellyite such as Isle Royal Greenstone and Thomsonite. Pictured here is two prehnite gemstones next to a vary hard to find piece of solid green prehnite with native copper inclusions. Prehnite is colorless to yellow, green, or white. 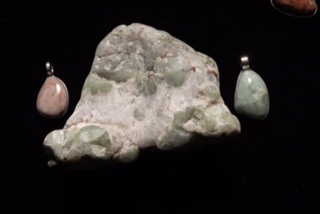 Prehnite found in the Keweenaw peninsula is often shaded with pastel pink to orange colors because of the specks of natural copper that causes the pleasant pink colors to saturate the phrehnite.